So this week was well played in my world. I found out a big lesson that keeps me on track. In the master keys we learn that you MUST be of service to others. This is the only way to achieve you DMP. 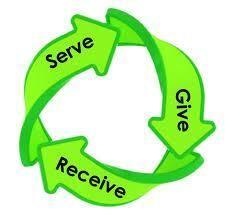 We must give before we can receive. I always wondered were I get my power to give? It’s from the self talk, reading, DMP, the sit and so on. But in other words it is the service we “give to our self”. This is the greatest service we can do!. Without this service we cannot give to others, if we cannot give to others we cannot be our true self and never reach the highest points in our life! In the beginning of the MKS we were writing down on cards and getting into habits. Remembering to do the exercises daily. This was doing the service to our self so we can start to build the new bridge via the new blueprint. Without this none of this would ever have worked or made sense. These last few weeks have been more amazing than ever. In the state of WI I have climbed to be 9th top producer . I have kept up the service to myself and that thought process has made all the difference in the world. Indeed the Law of Success is Service. This was doing the service to ourselves so we can start to build the new bridge via the new blueprint. Awesome post! Bhagavad Gita Chapter 18: 41- 44 Brahmanas, ksatriyas, vaisyas and sudras are distinguished by their qualities of work, O chastiser of the enemy, in accordance with the modes of nature. Peacefulness, self-control, austerity, purity, tolerance, honesty, wisdom, knowledge, and religiousness–these are the qualities by which the brahmanas work. Heroism, power, determination, resourcefulness, courage in battle, generosity, and leadership are the qualities of work for the ksatriyas. Chapter 18, Verse 44. Thank you for your great insight Brian!! What a great idea to be in service … of our self. Thanks.